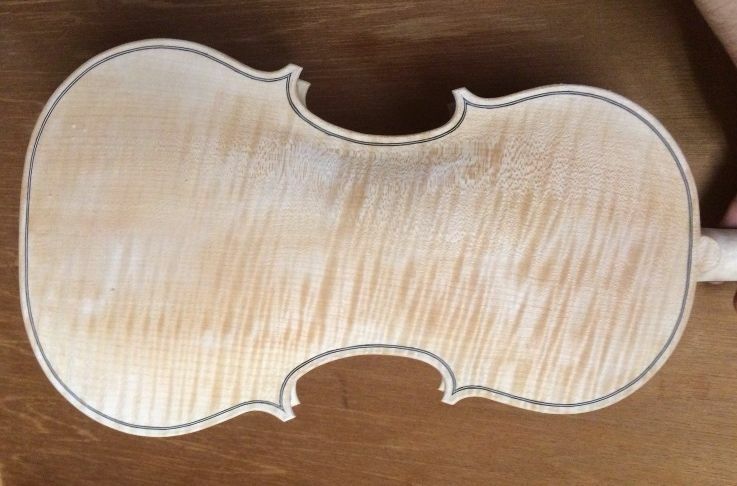 You can see that the grain is somewhat obscured, and the color is quite light. I am wondering whether I did not succeed in rubbing the gypsum into the wood, as thoroughly as usual. Usually, the color has been nearly chalk-white. I can see the gypsum in the wood, though, so I am going to press on with the sealer coat. This time, the sealer consisted of ordinary rosin in a solution of “pure spirits of gum turpentine”. I probably should have made it a little thinner. It was about like light syrup; so, afterward, I dipped the brush in plain turpentine, and went back over the instrument to help the stuff penetrate a little better. The turpentine will all evaporate over the next few days (I hope), leaving only the rosin, solidifying in the pores of the wood. It is always impressive to see just how completely the gypsum disappears, under the sealer. The back plate, with the sealer coat applied. Front plate and side, with the sealer coat applied. 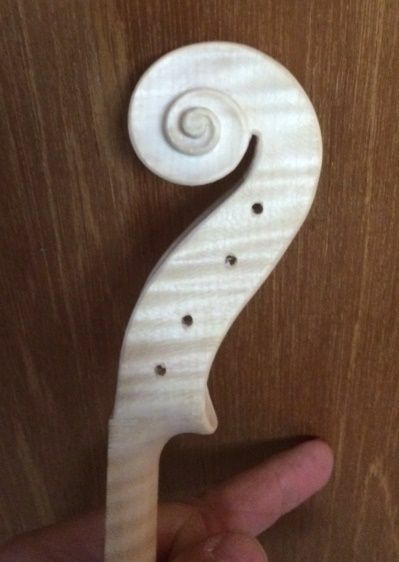 Different light angle shows the curl in a more attractive mode. Until that sealer dries completely, I will have to find other things to do. But it is hanging in a warm room, so it should dry rapidly. After that, It will be varnish coat after varnish coat, until it it is all done. Then the final set-up can occur. I have chosen to use the “French” method of inside-mold. Rather than have the blocks and ribs centered on the mold, as the “Italian” method entails, and which allows the maker to install the linings on both front and back sides before either removing the mold or installing a plate, the “French” method applies the blocks and ribs flush to one side, and requires mold removal before installing the second set of linings. The advantage of the “French” method is that it makes mold removal ridiculously easy and fast. 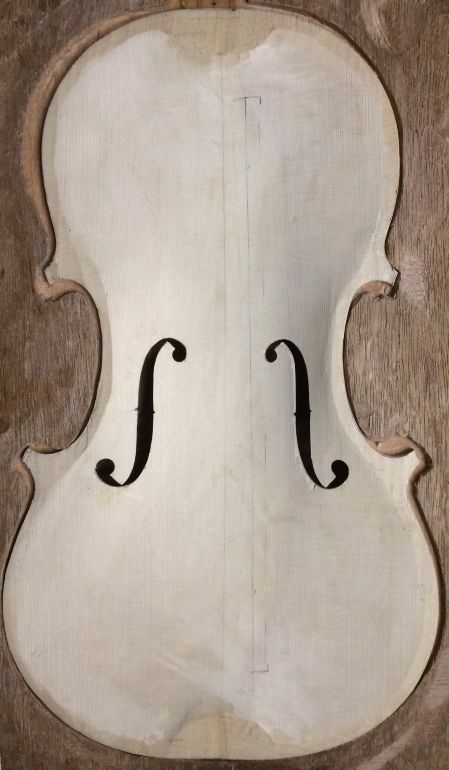 The disadvantage is that, when the mold is removed, the ribs are extremely fragile while waiting for linings. I have sometimes used a two-part mold, which makes mold removal fairly easy, but allows me to install all the linings before removing the mold…but it can be a bother, too, so, for now, I have reverted to using the flush method. 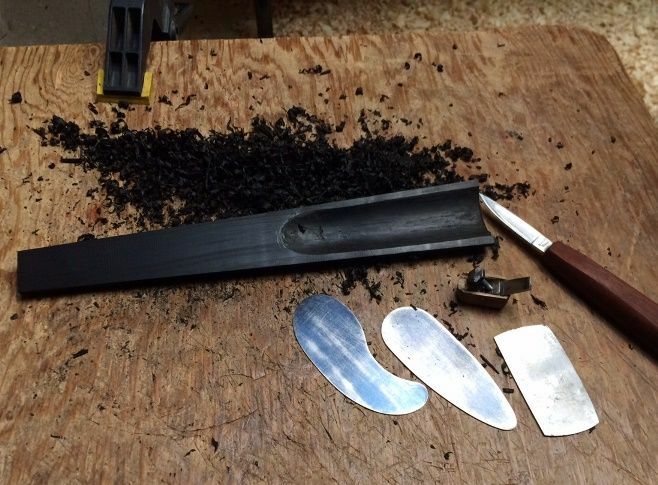 To remove the mold, I brace the completed front plate tightly against my thigh, to support it and pad it, then use a sharp chisel and a light mallet to give a sharp rap to each of the joints between the mold and the blocks. 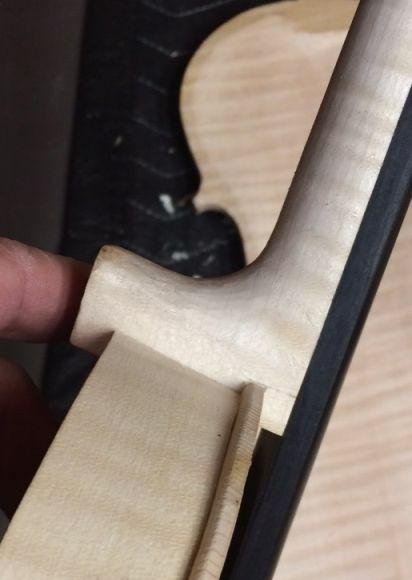 I have been careful to only allow glue on the flat central surface of each block, and I also carefully waxed the areas of the mold where I did not want glue to stick (by vigorously rubbing a candle over those surfaces), so the sudden wedging action of the mallet and chisel in each joint usually pops them cleanly apart. 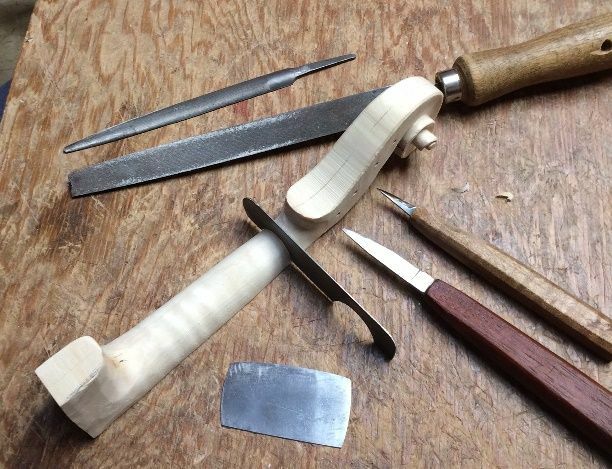 I check each joint with my parting knife, though, to make sure they are really free, before attempting to remove the mold. 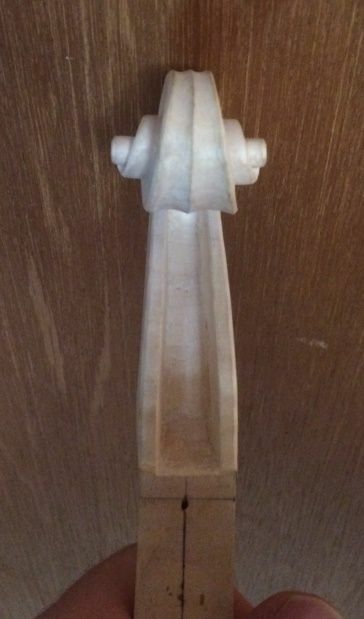 Then, I simply hold the mold, with my fingers through the clamping holes, and tap on all the blocks with the handle of a chisel, and the garland slides smoothly off the mold. I always feel a little anxious about “hammering” on the mold, so, this time, I thought perhaps I could just “trim the blocks” with a chisel, and loosen the mold that way, and avoid the mallet. 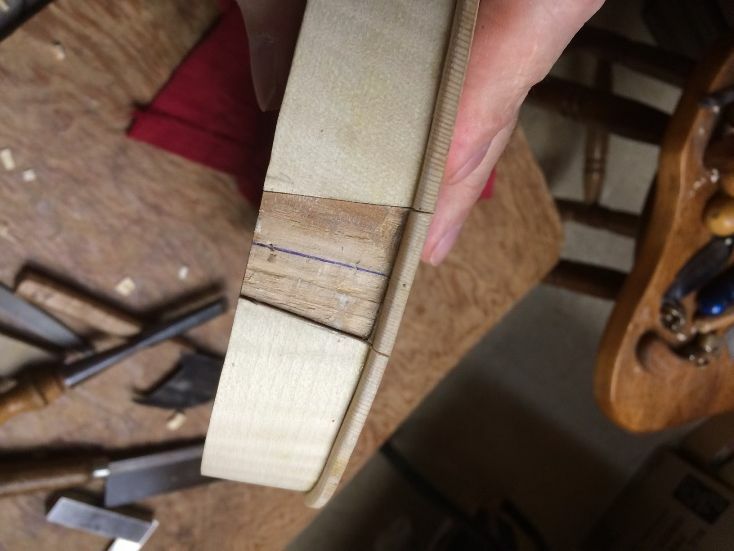 You can see the cut marks on the one corner block and one end block…but that was fruitless, and I reverted to the mallet and chisel, which (as always) worked flawlessly. 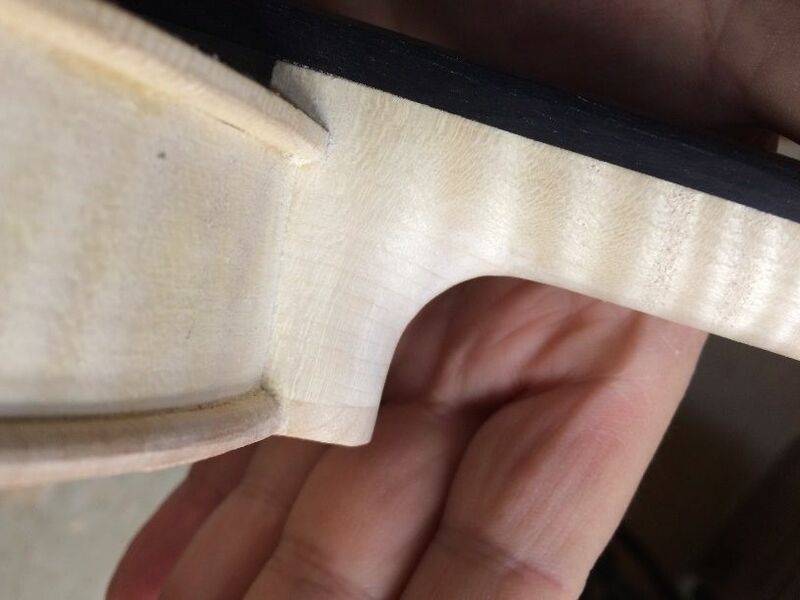 You can also see that, before removing the mold, I had taken the time to saw off the excess wood from the neck heel, so that it is very nearly flush with the back of the garland. The mold has been removed, but the blocks are still rough, and the linings have not been installed. You can see how fragile the ribs look, without linings. So I bent a handful of linings, and installed them, using hot hide glue and small spring clamps. 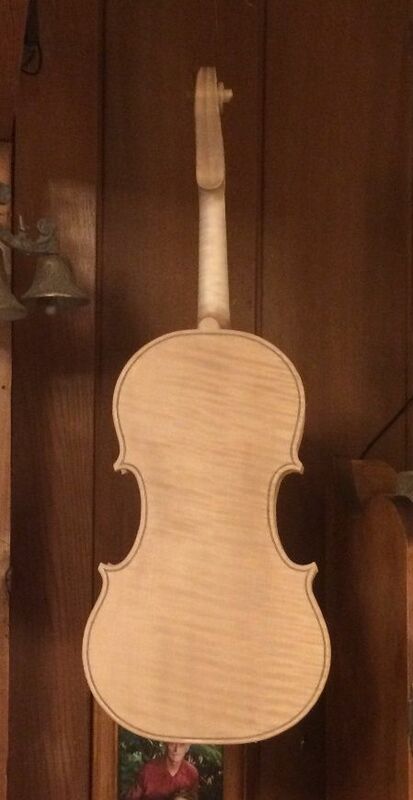 Back of neck-heel, planed flush with the back of the garland. After the glue for the linings was dry, I removed the clamps, and planed the edges of the linings flush with the rib edges. 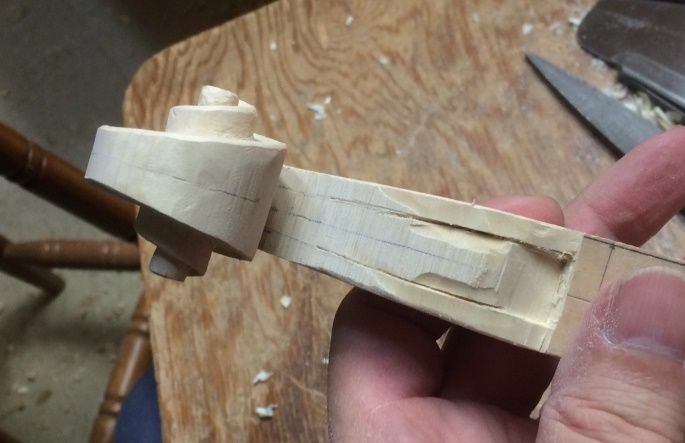 Then I trimmed the inside of the linings to taper into the rib surface, and shaped the blocks to their final contour. I will still clean things up a little more, before closing, but it is getting close. There was a joint that did not get quite enough glue, so I inserted more hot hide glue and clamped it securely. I will wait until tomorrow to take the clamps off and close the corpus. In the meantime, I spent some more time scraping the back plate smooth, inside and out. It really looks about the same, so I will not post more photos. There were just some discontinuities that I wanted removed. I went ahead and shaped the inner edge of the perimeter of the back plate, too, so it is ready to be glued to the corpus. Blocks and linings shaped and scraped. 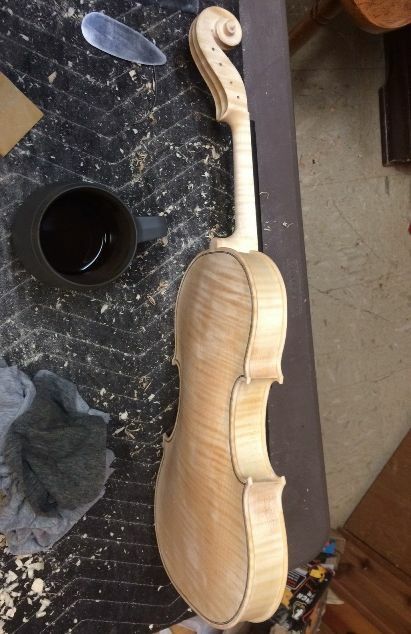 When I last posted, I had just temporarily attached the fingerboard to the neck, but had not carved the pegbox, nor the fluting on the back and top of the scroll. 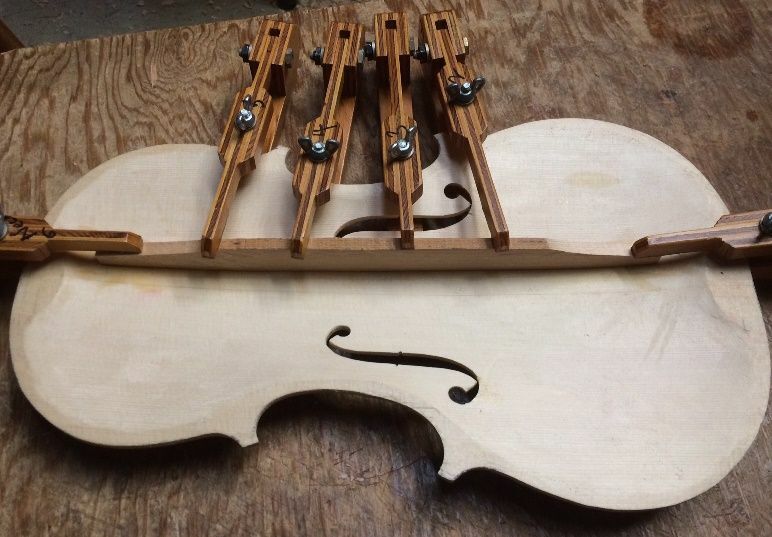 In the past I have completed those before attaching the fingerboard, but this time I was anxious to get going, and it seemed a good idea at the time…. 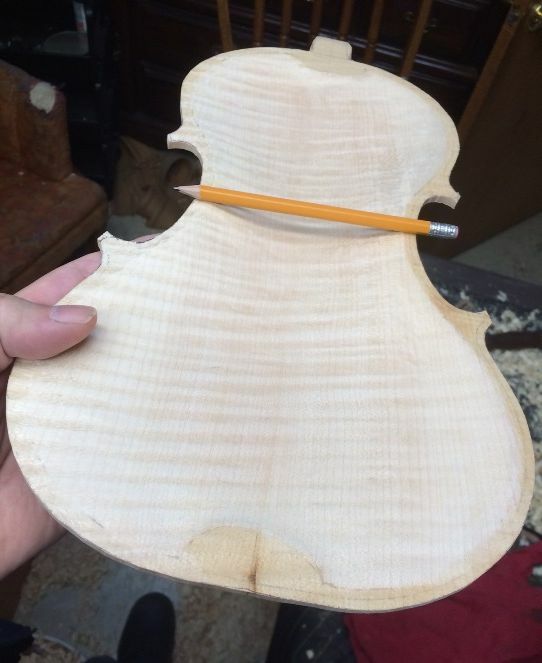 So…I first shaved the fingerboard sides to fairly closely match the handle portion of the neck, and then began carving the pegbox. 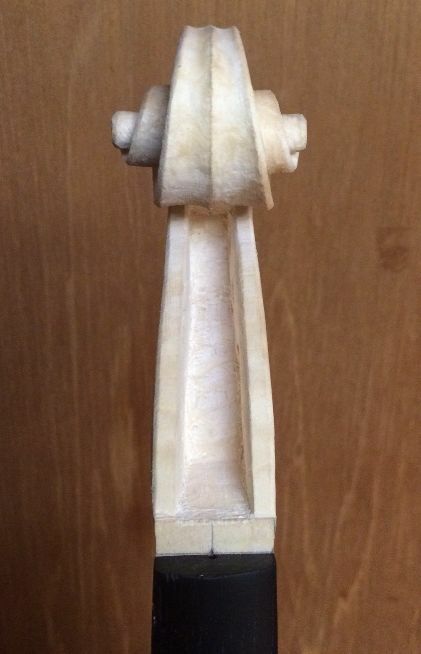 Carving complete: scraping and filing to follow. 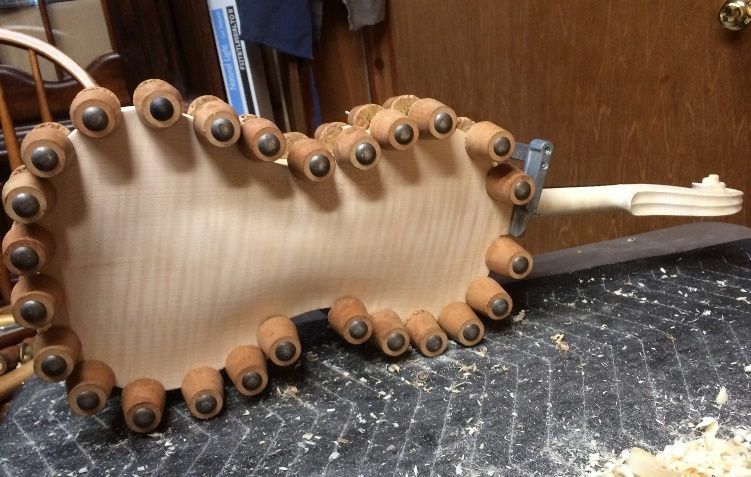 Neck is nearing completion, outside and inside of Pegbox are pretty much complete. 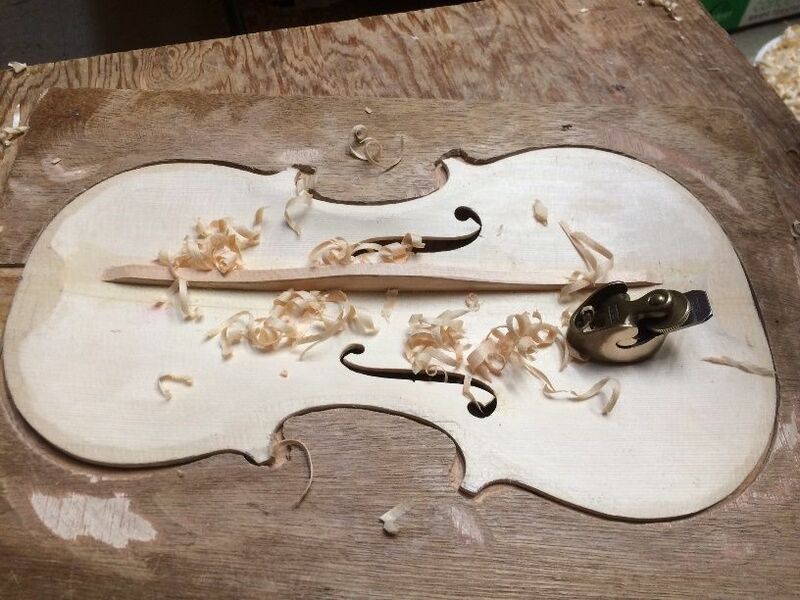 No fluting yet. 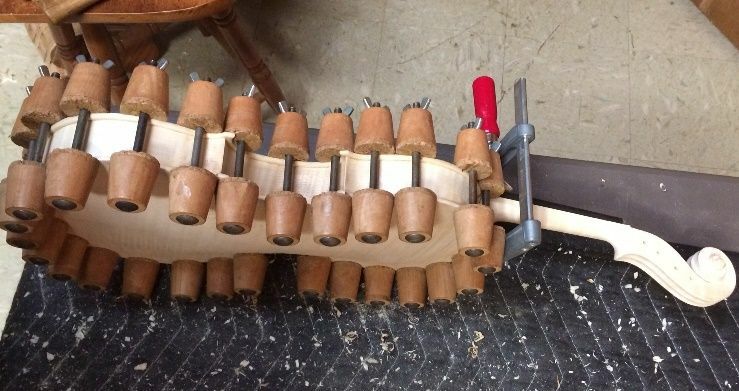 Fluting nearing completion: front view. Lots of scraping left to do. 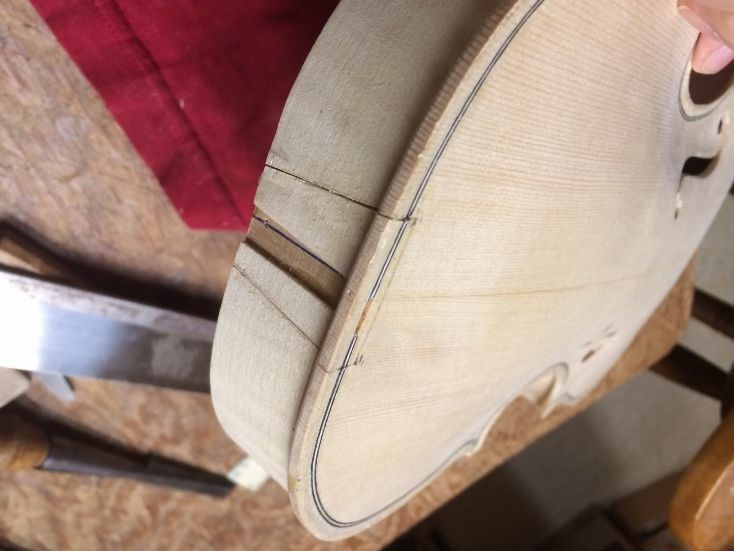 Before I can set the neck, I have to lay out the exact footprint of the neck heel on the centerline of the corpus, where I will cut the mortise through the ribs and into the neck-block. 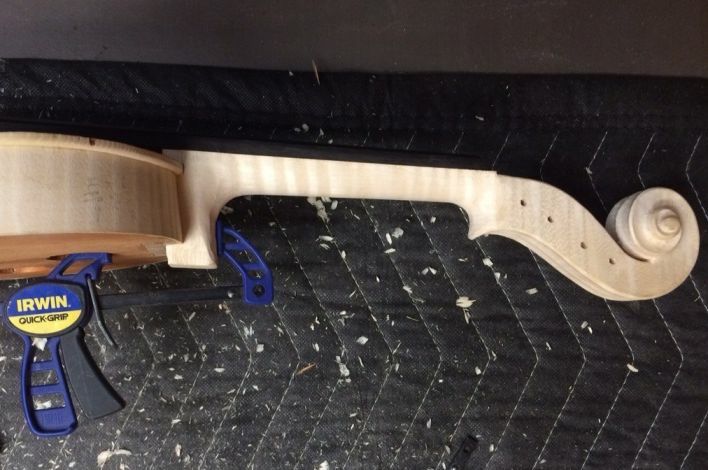 I have deliberately left the heel long, so that I can set it through the neck-block, and not have to worry about fitting against the back button, because I haven’t installed the back plate yet. 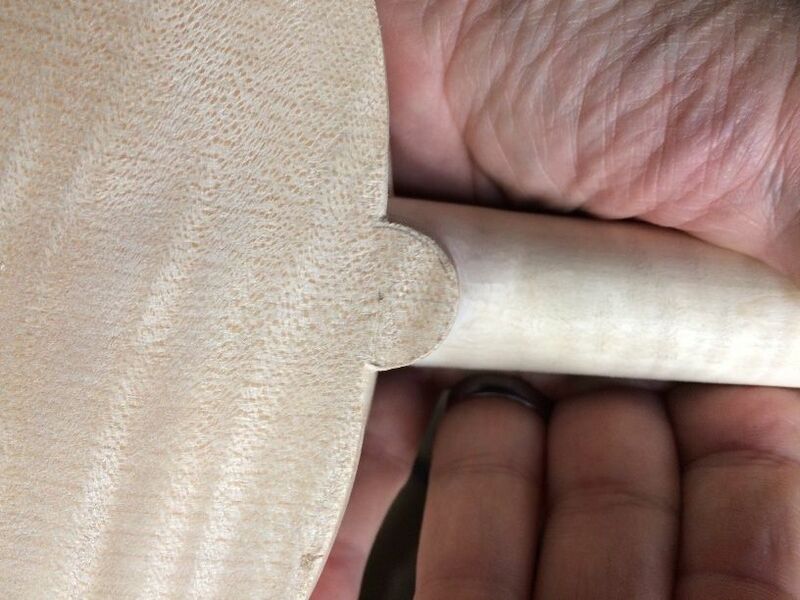 I will trim the heel afterward, and, when I level the back of the corpus, just before installing the back plate, I will level the heel right along with the linings and blocks. 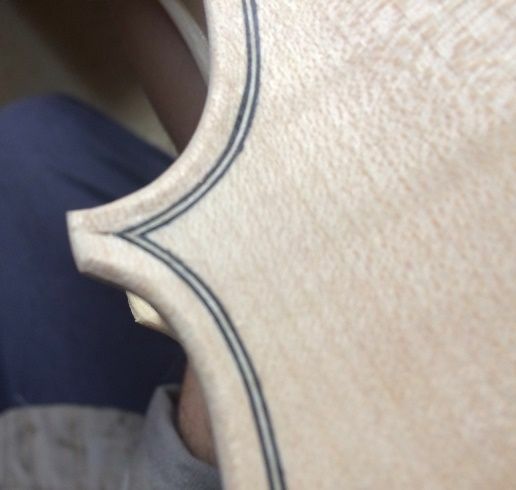 The mortise is laid out off the centerline, which you can barely see in this photo, because one top rib nearly obscured it. First, I removed the rib ends, and double-checked my layout lines. Then I removed the waste wood from the edge of the front plate. 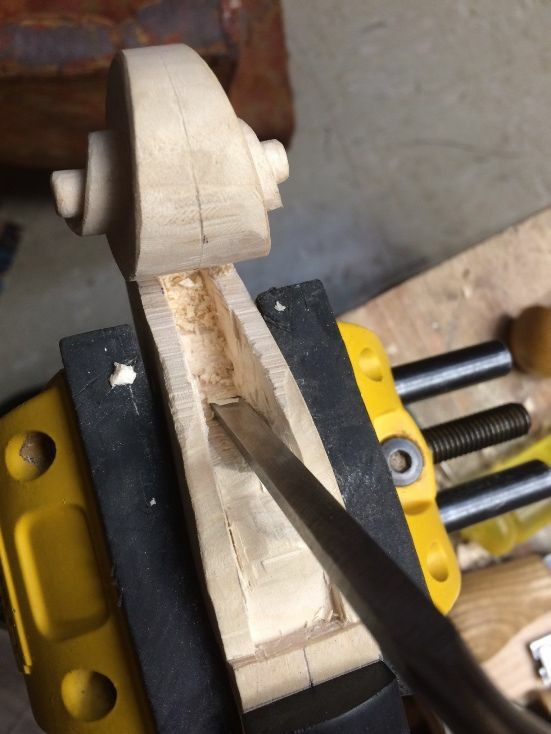 Then I began chiseling away the block wood, to open the mortise. 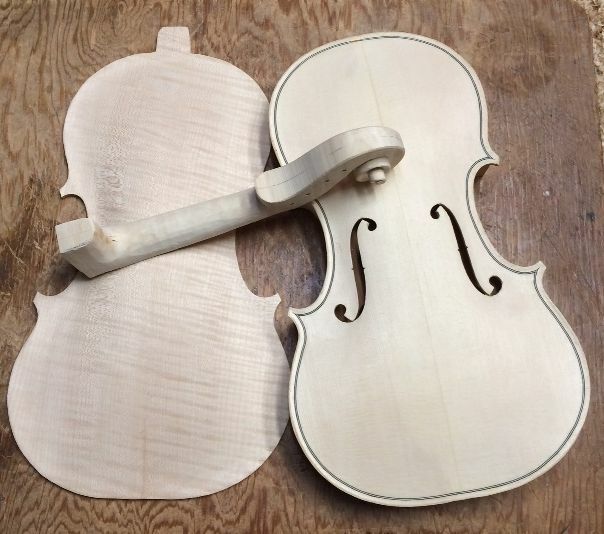 The mortise has to fit the neck in every respect: It has to be the right width and shape, so that the neck goes to the correct depth. (I wanted a 6mm overstand at the edge of the front plate.) It has to be the right depth so that the distance from the front edge of the nut, to the top of the front plate will be exactly 130mm. The sole of the mortise has to be flat, so as to fit tightly against the end of the neck, but at the correct angles, both laterally and fore-and-aft, so that the neck is not twisted in relation to the corpus, the centerline of the neck is in line with the centerline of the corpus, and the projection angle is either exactly right or just a shade high. 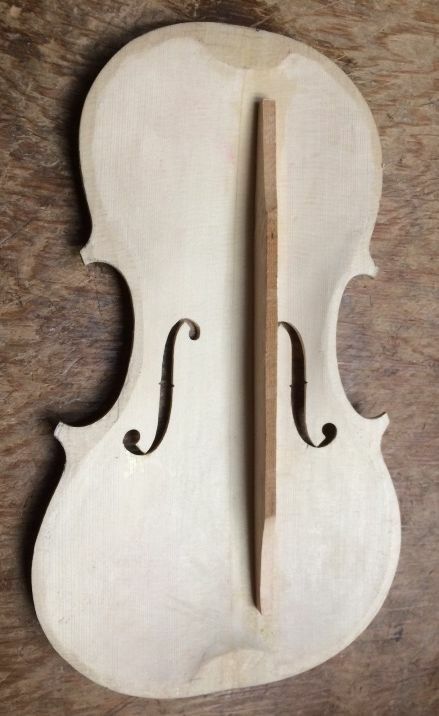 I have had instruments change fairly rapidly after they have been strung at tension for a while, due to the top bulging a little as it is compressed by the string pressure, so, I deliberately set the projection angle just a tiny bit high, anticipating that it will change a bit under string tension. Dry-fit neck-set. No glue, yet. Just the final check of all measurements and angles. Dry-fit check of overstand mark and neck length mark. Both are correct. 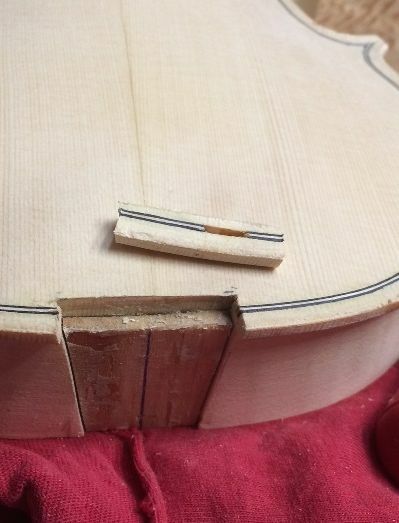 When I am finally satisfied that all is correct, I remove the neck one last time, slather the hot hide glue into the mortise, and shove the neck home for good. I quickly check all measurements, to make sure I got it in correctly. I only have a few seconds before that glue sets up permanently. Fortunately, all was still good, and I applied a single clamp to hold it until the glue dries. You can see that I have about 10mm of extra heel hanging out behind the back of the neck block. I will saw that off, nearly flush, plane it as close to flush as I dare, then, after removing the mold, installing the back linings, and trimming the linings and blocks, I will level the entire back of the corpus, including the heel, on a “sanding board.” When all is perfectly flat, I will install the back plate, and the violin will begin to take on a life of its own. 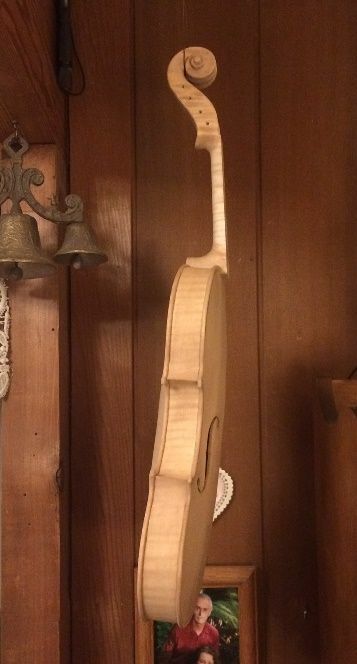 For some reason, after I close the corpus, or thereabouts, I cease to see the instruments I make as a “project I am building”, and simply see them as an instrument I am working on. 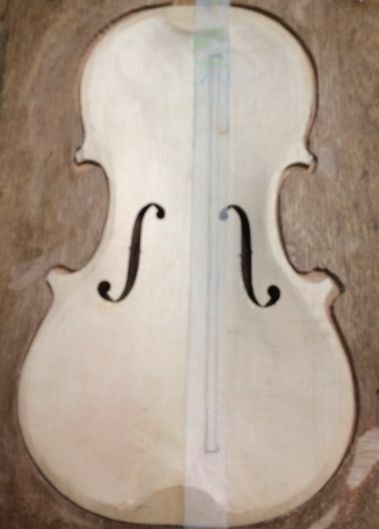 I am working on a violin, at that point, not just something that will become a violin. 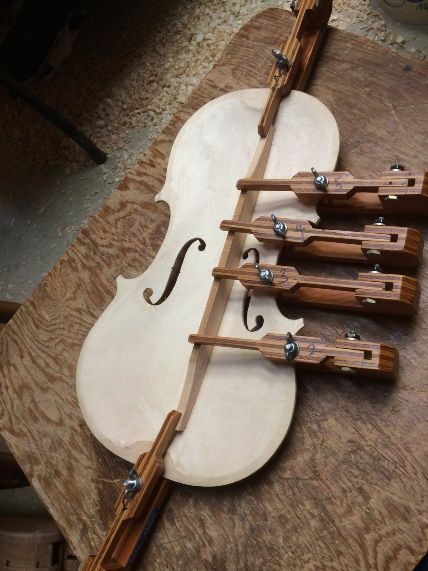 It is a strange feeling, but it has happened on every instrument. 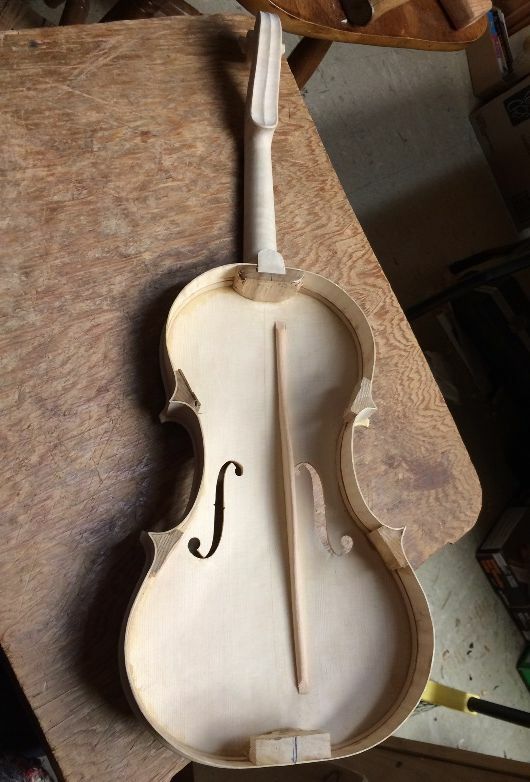 A student, who built his first instrument under my guidance, put it another way: as the instrument came together, he suddenly said, “This is getting real!” I knew exactly what he meant. Next time I will remove the mold, install the back linings, shape the blocks, and maybe get this thing closed up! When I last posted, I had installed the bass bar, and left it to dry overnight. 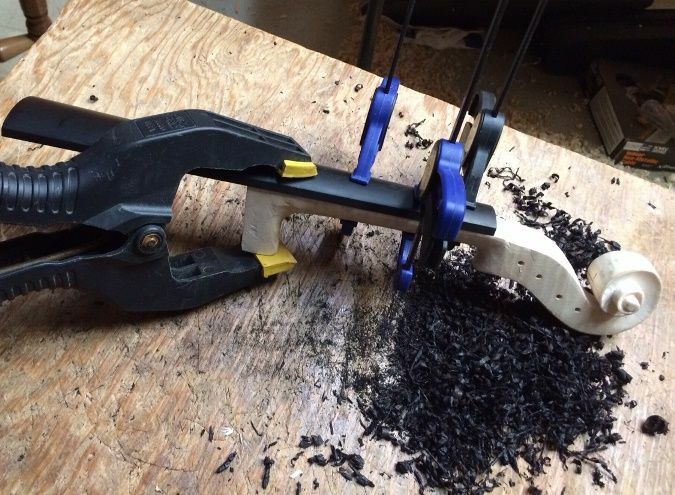 (I did remove clamps too early one time…not good.) We needed to chauffeur a family member to the airport, in the morning, but before we left, I did get the clamps off and the bass bar completed. The rest of the day was occupied with other things. Clamps removed: Bass bar still in raw condition. I sketched the general shape and size I wanted the bass bar to end up. Then I planed the profile shape, using an Ibex plane. 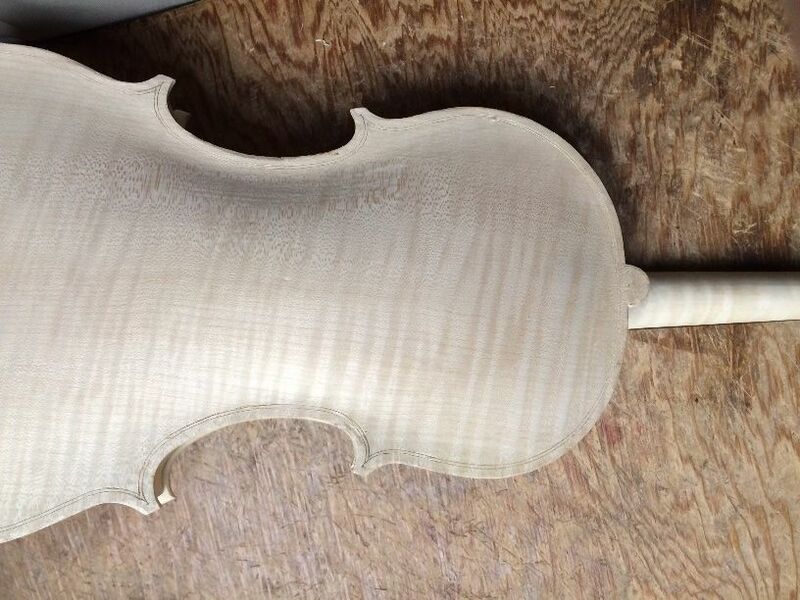 Notice the Sitka Spruce color is lightening up, as I plane away the older surface wood. 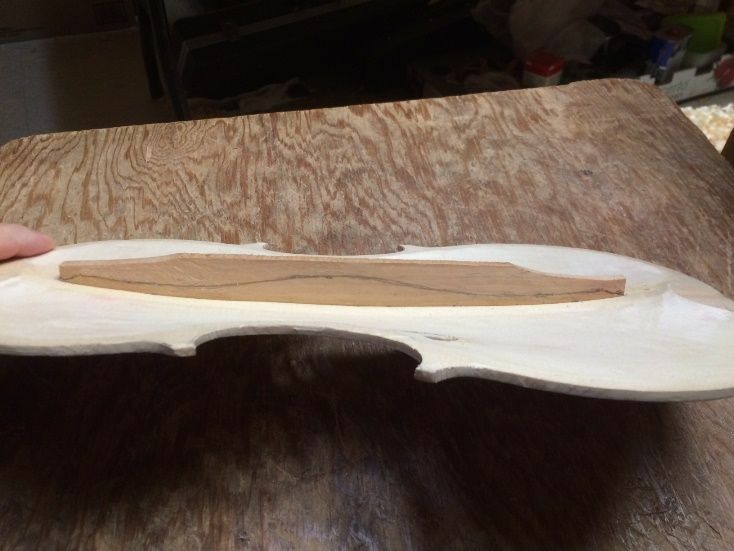 Bass bar complete, footprint view; after planing and scraping. 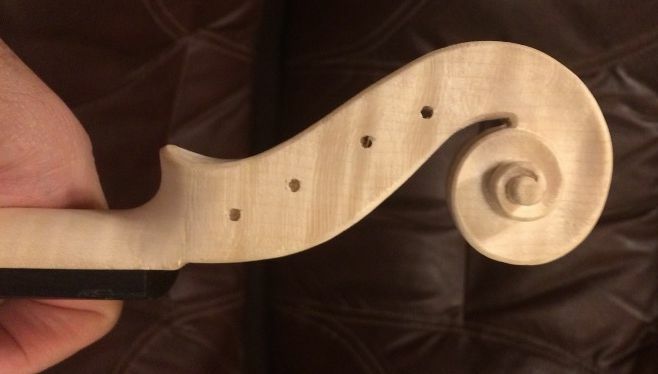 Profile view of completed bass bar. 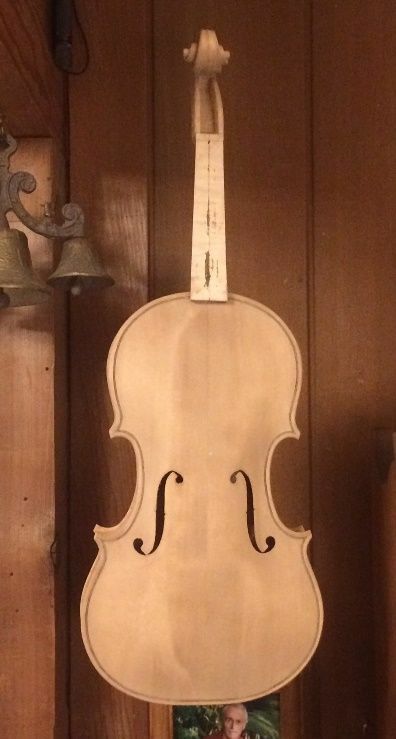 Back, neck, garland and front plate. 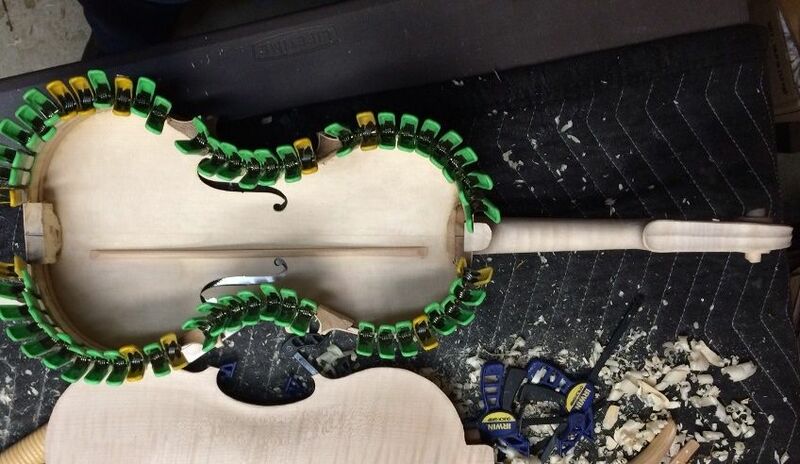 While the glue dried between the garland and front plate, I completed the neck carving. 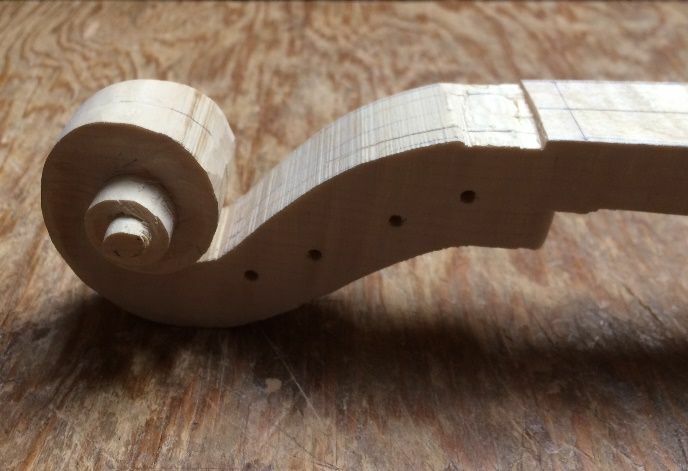 There are still things to do: I have not carved the volute, yet, nor even the pegbox (usually I complete it before adding the fingerboard), but I was anxious to get the fingerboard installed, so that I could set the neck sometime soon. 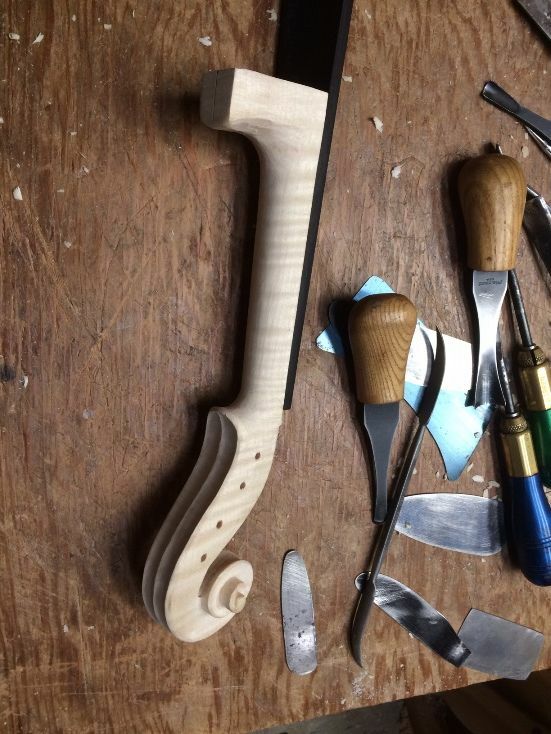 Completing the neck and scroll. 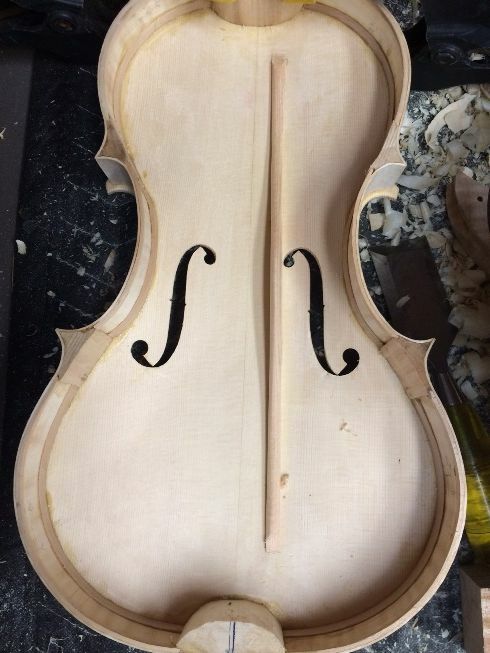 That gauge, with the cutouts, sizes the neck, top and bottom. 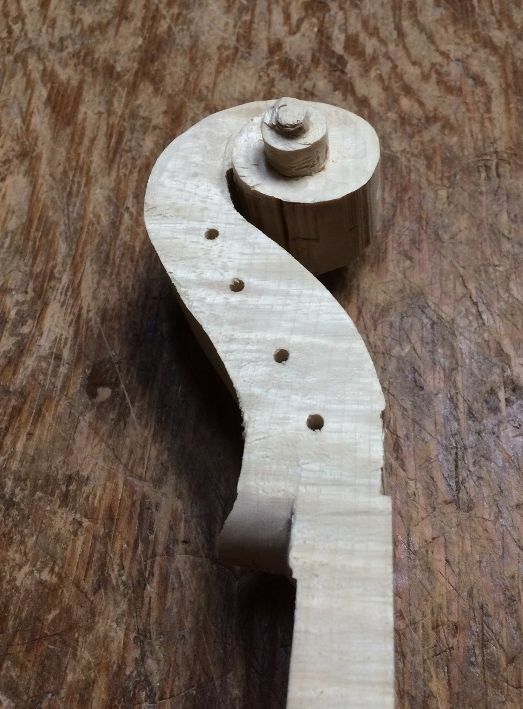 Once I was satisfied with the neck and scroll, I decided to begin the fingerboard. 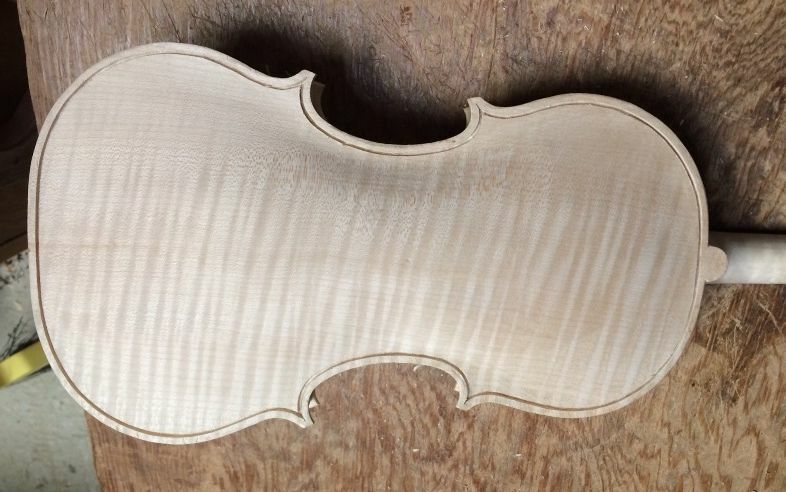 I first planed it until the edges were a consistent 5 mm thick. 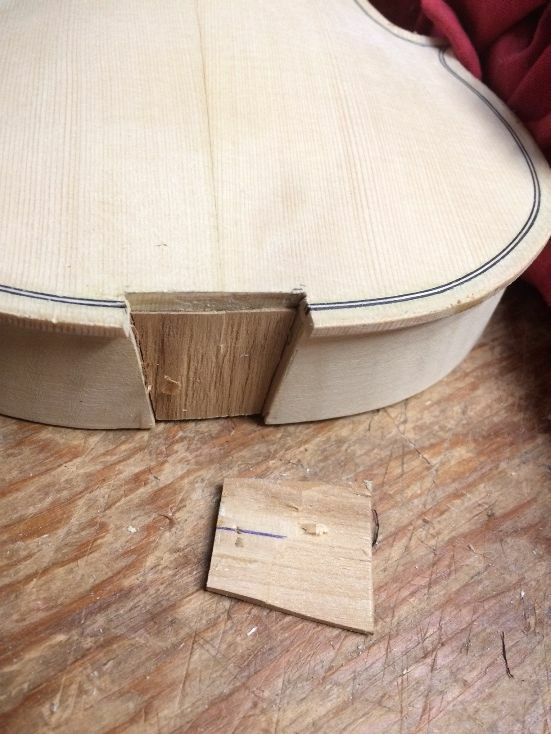 Then I laid out the shape of the hollowed portion underneath the fingerboard, so that I could carve it out. I wanted the hollow to end just a few millimeters from the lower end of the neck, and be about 5mm thick all over. 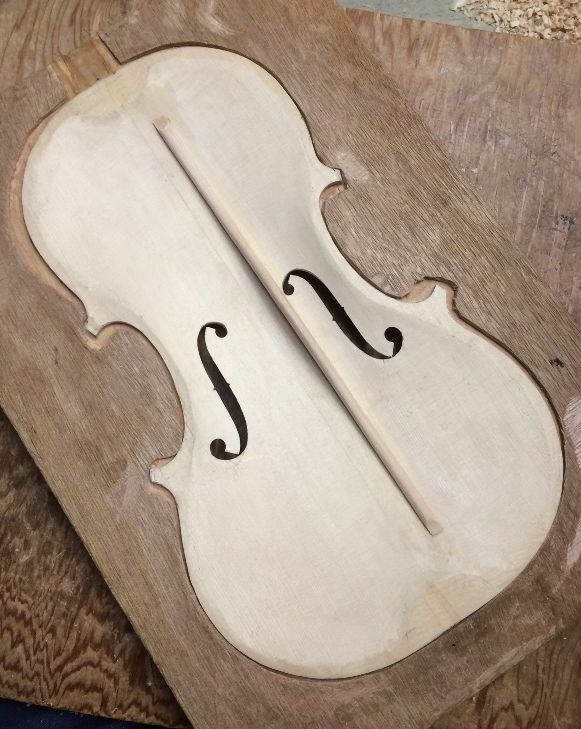 The hollow is laid out after the fingerboard has been planed to proper thickness. I carved, planed and scraped away the ebony until the hollow was the size and shape I wanted it to be. 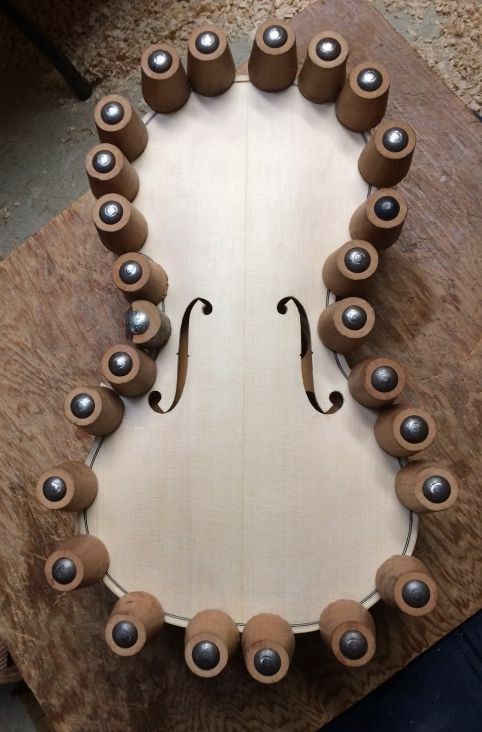 Fingerboard temporarily attached to the neck, with three dots of hot hide glue. 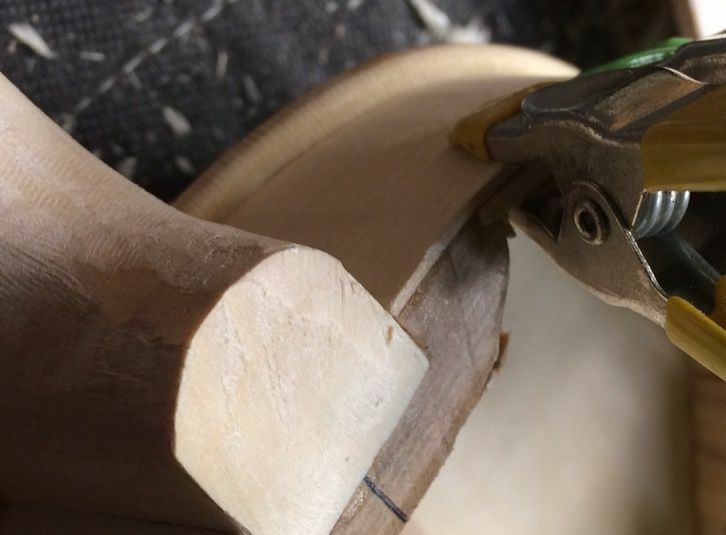 Temporarily attaching the fingerboard allows me to complete the shaping of the handle portion of the neck and the fingerboard together, as a unit. 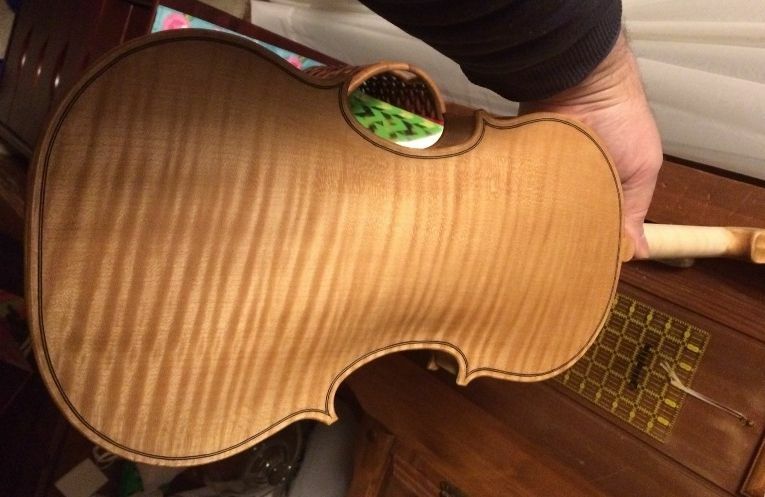 I will then set the neck with the fingerboard still in place, but pop the fingerboard back off while I varnish the violin. So…that is as far as I got today, but I feel relatively satisfied with the progress. More Progress: Plates and Scroll. 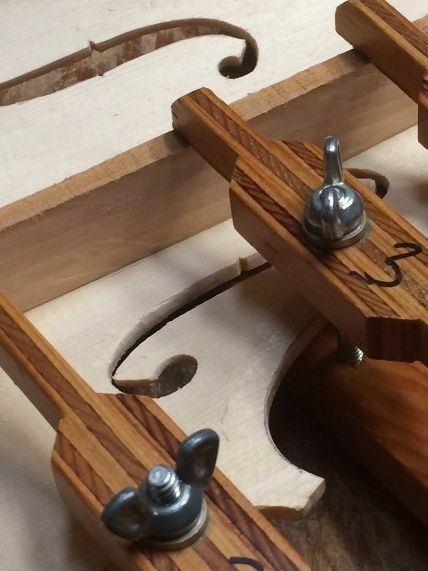 To fit a bass bar, I begin with a completed front plate, and lay out the position of the bass bar, so that the distance from the center to the bar, level with upper and lower bouts at maximum width, is 1/7th the full distance from centerline to the edge at those respective points. Usually, that means that the lower point will be about 15mm from the centerline and the upper one about 12mm (as it is in this case.) 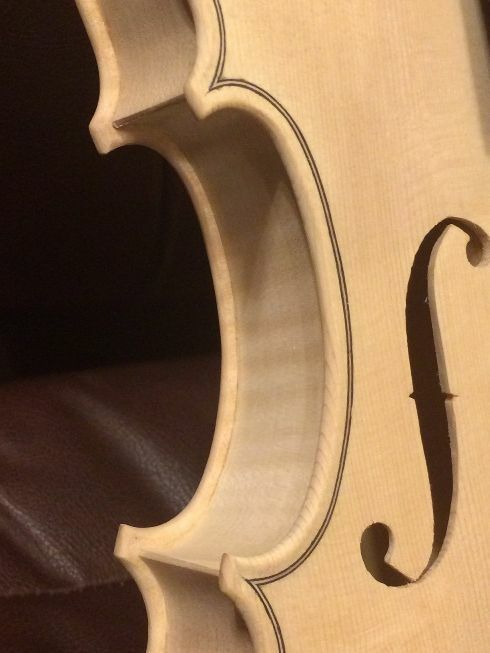 I lay out a line through those two points, and observe where it is, nearest to the bass-side f-hole. If it is too close, I “fudge” it away, a bit, trying not to change the angle. (The bass bar has to clear the f-hole.) 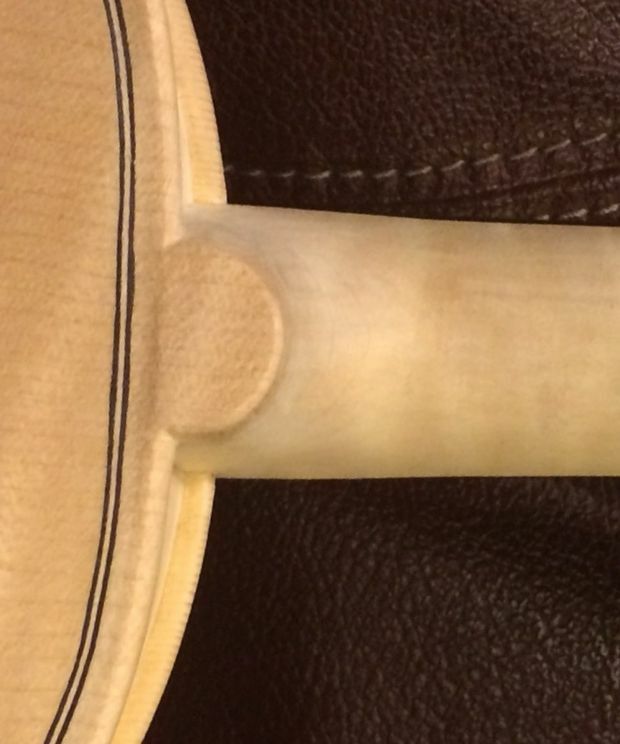 Then I mark the two ends, 40mm away from the ends of the plate, and that is the place to fit the bass bar: the “footprint”, so to speak. Bass bar position laid out. I use chalk to fit my bass-bars. 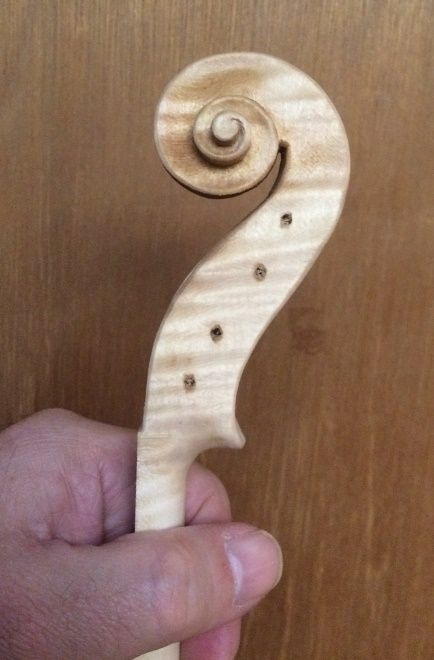 I have never had a good enough eye, and a sure enough knife-hand to accurately fit a bass-bar without the use of chalk, though I have known master makers who regularly did so…perfectly. (Sorry… I’m not good enough for that.) 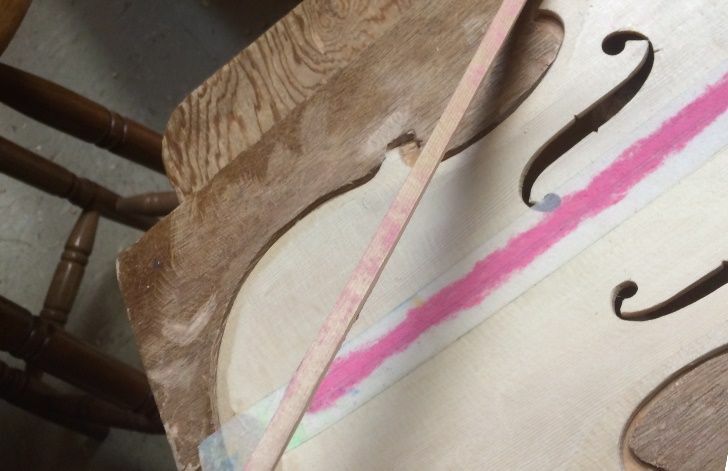 On the other hand, I have had some nasty experiences with the residue of blue chalk mingling with the yellowish hide glue when installing a bass bar: it left a very ugly green stain…and it never completely came out. So…what to do? In the first place, I switched to pink chalk. If a little chalk is left, the glue will simply make it look a bit orange. (No problem.) But, I really don’t want chalk residue at all. A friend showed me the paper “gauze” tape available in pharmacies. 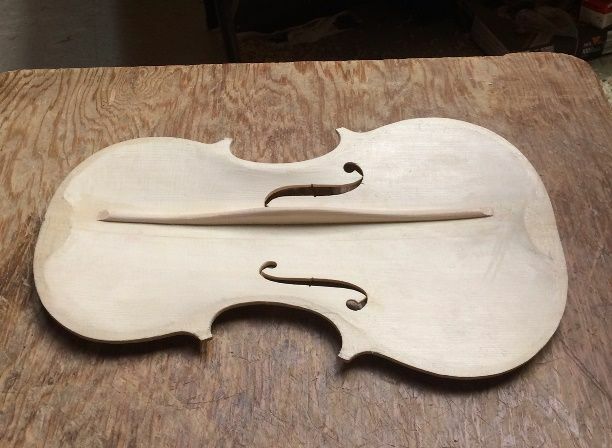 It is thin enough to completely conform to the surface of the plate, and produce a good fit, and, it is slightly translucent, so I can see my layout lines through the tape, and keep the chalk on just the path of the bass bar. 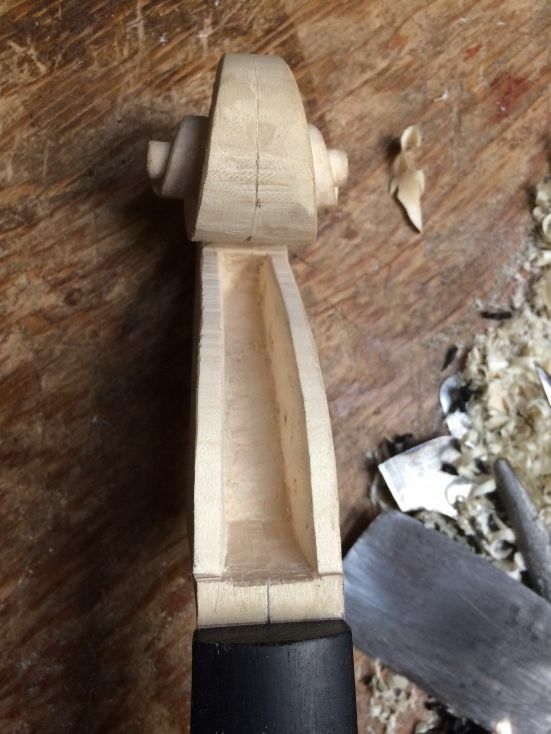 I first use a compass to mark the general shape of the bottom of the bass bar, and then trim it with a knife and a small plane. That gets me “in the ball-park,” so to speak. After that, it is chalk-fitting time. 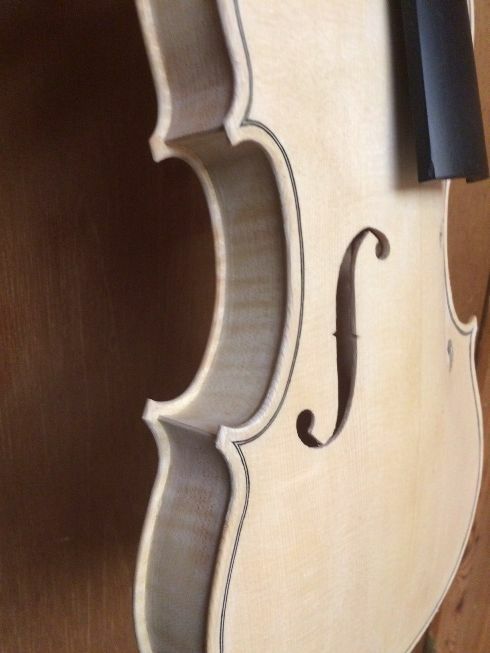 The front plate is made of European spruce, but I chose Sitka spruce for the bass bar. There is quite a contrast in color between relatively fresh European spruce, and well-aged Sitka spruce. It actually made it a little difficult to see the pink chalk against the dark wood. But it worked. 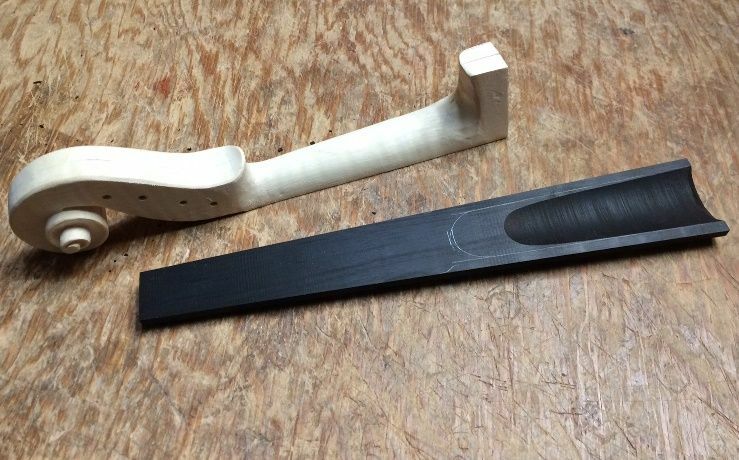 Bass bar blank, knife-trimmed after tracing the shape with a compass. 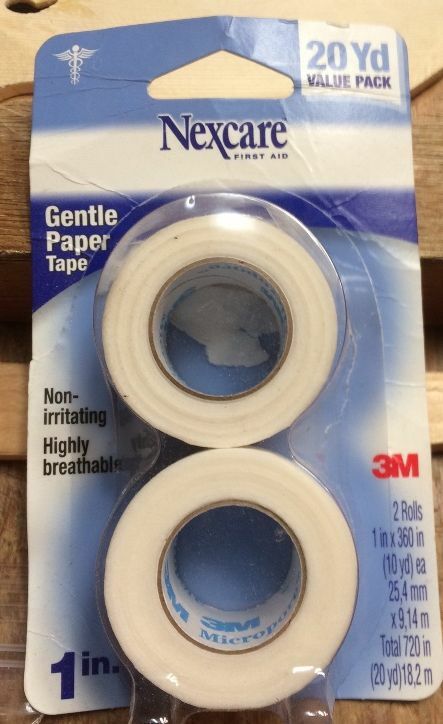 This is the paper gauze tape I use for chalk-fitting. 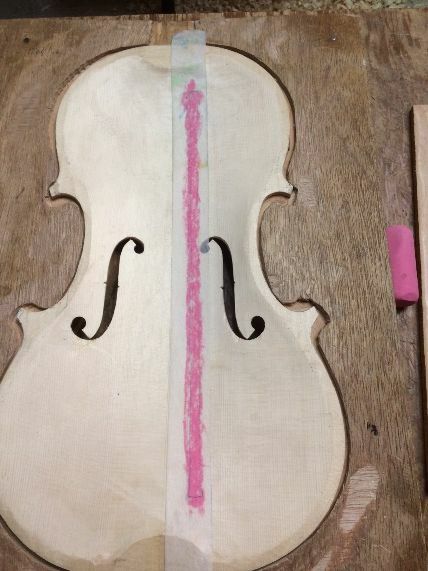 Paper gauze tape and pink chalk, ready to begin chalk-fitting. 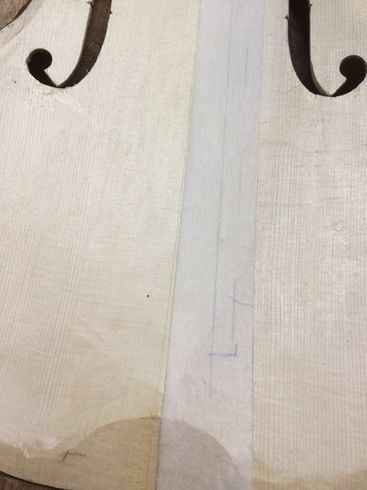 Layout lines visible through the tape. Layout lines traced over on the tape, in pencil, to make them even more visible. 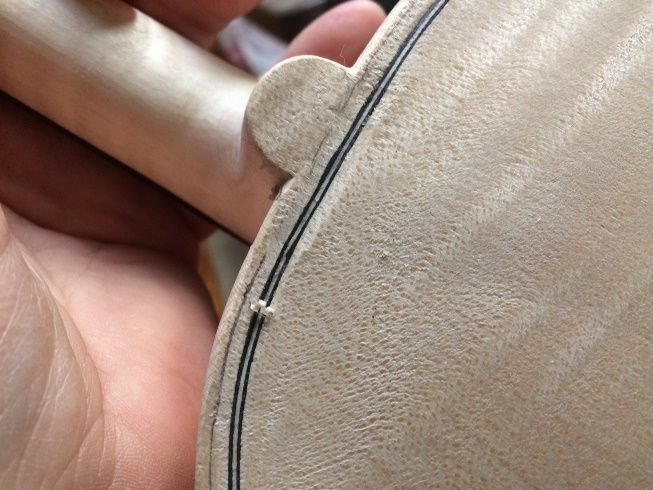 The idea, in any chalk-fitting procedure, is to press the fitted part (being fitted) into the chalked surface to which it is being fit, then trim away only the portions where the chalk transferred. 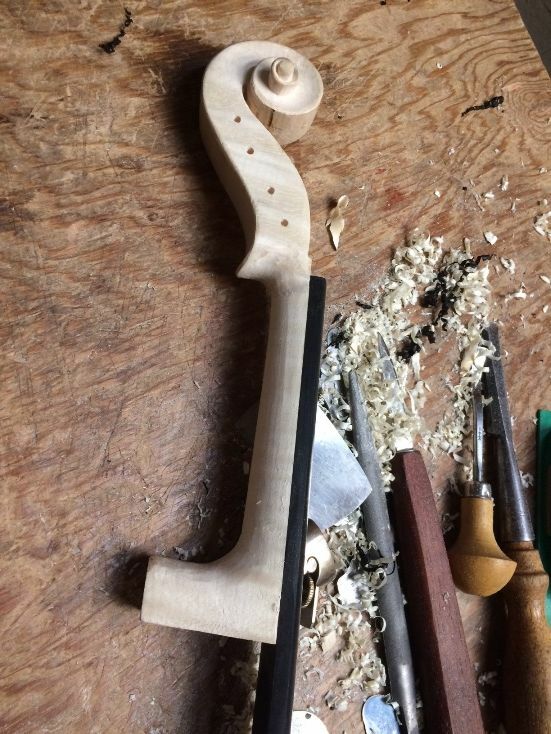 So, in the case of the bass bar, I need to press it into the chalked top plate, and then check the bottom of the bass bar blank, to see where to cut. I trim off the obvious spots, and try again. Ideally, every time I try, I will get a broader transfer of chalk. When the whole area gets a light dusting of chalk at one time, the fit is as close to perfect as I can get it. 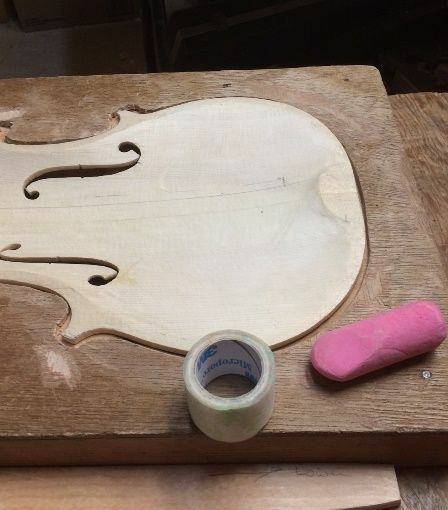 I remove the tape, wipe off any chalk residue, slather the hot hide glue onto the bottom of the bass bar, and clamp it home. On a good day, it takes me a half-hour. On a bad day? Don’t ask… 🙂 This time wasn’t bad, though. Chalk-fitting complete; Dry-clamped to check the fit. 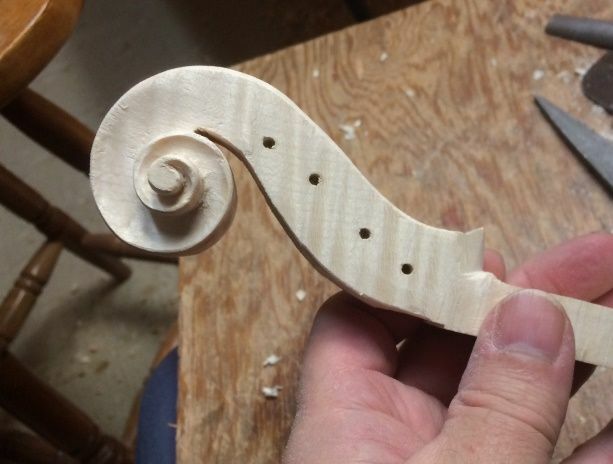 While the glue was drying on the bass bar, I went back to work on the scroll. It was looking verrry rough when I had to take a break, so it is nice to see it progressing better, now. There is still a lot to do. 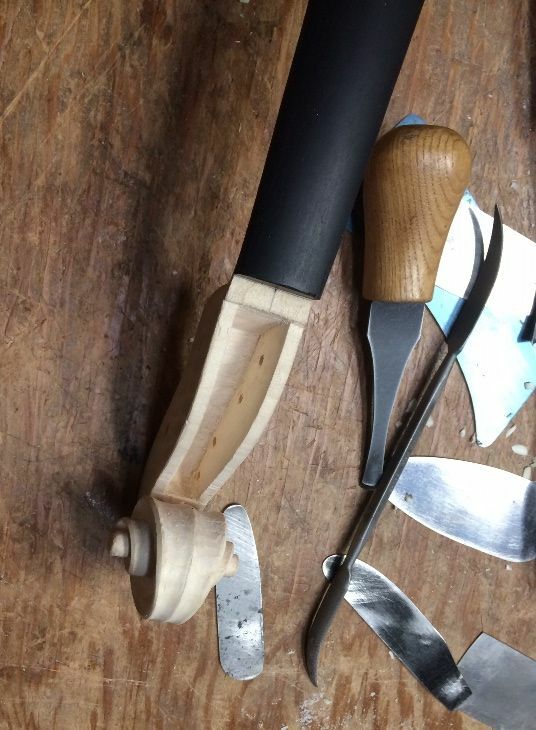 I have to excavate the pegbox, and cut the fluting in the volute. But this is as far as I am going tonight. I am glad to call it a night, and let my hands rest. 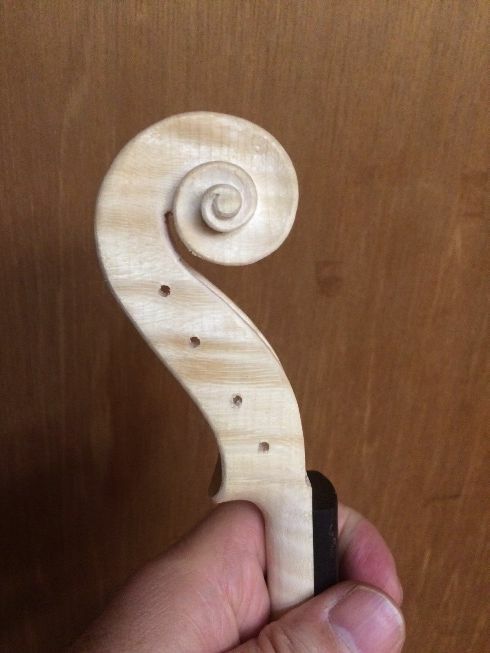 More scroll progress: there is still a long way to go, but it is looking better. Final status for tonight. Looking a lot better, and more encouraging to see. 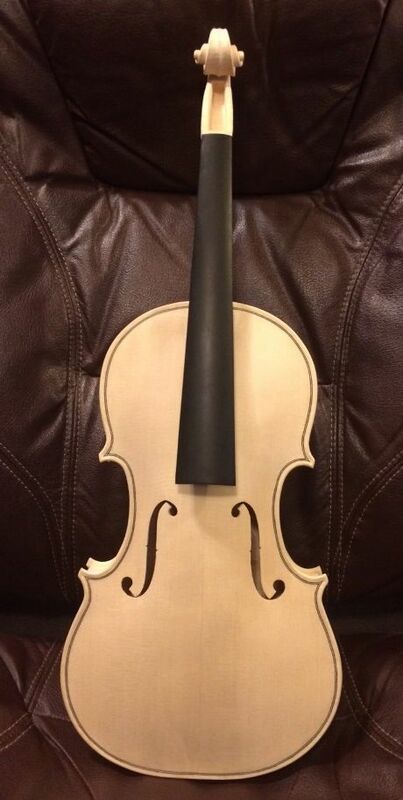 I have other things to do tomorrow, so I may or may not get to work on the violin. 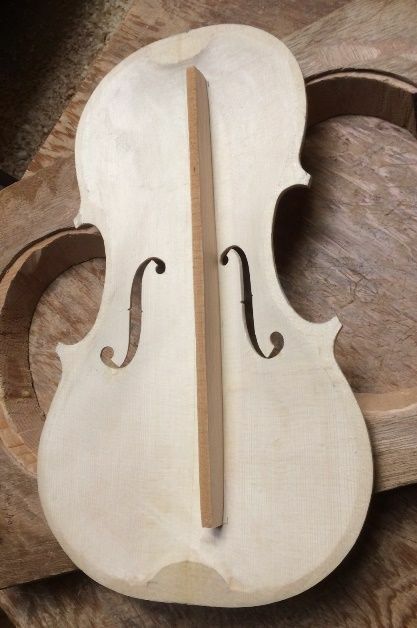 At the very least, I expect I will be able to trim the bass bar to the shape I want it, but beyond that, I don’t know.